On Friday, the AJC ran an article about the "profitability" of the Georgia program. The article names the Georgia Athletic Department as the most profitable in the country. Damon ponders where to spend the loot. Damon is right to say that the term "profitability" is misleading in favor of using the term "unallocated funds." Profits are the sort of thing that you sit on and make your bank account fatter or return to your investors in the form of dividend. While we are certainly returning a portion of the profits to the bank account as sort of a rainy day fund, much of the "unallocated funds" are being invested in capital campaign projects such as the Stegeman Annex and the other $90 million worth of new buildings that have saddled us with a very large debt load for athletics. I'm working to get a better understanding of the finances here, but it doesn't appear that we're hoarding cash. It more appears that Damon didn't do as good a job as he should have in explaining the numbers. Owner of maps showing only the Confederacy. Never scheduled off the map. UGA blogger Tommy Perkins suggests that we shouldn't hoard cache, and we should instead invest the money in basketball or traveling more broadly in football. Kyle King agrees with him. First off, I would argue that Damon is working to travel more. With games booked on the road against Colorado, Arizona State, Louisville and Clemson, Damon is working to remove the stigma that UGA won't play road non-conference games. Secondly, with the Stegeman Annex, he's working to eliminate the problem of under investment in men's hoops. 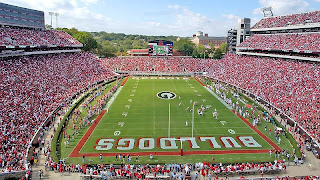 Since 1996, Georgia has invested $35 million in basketball facilities while investing $52+ million in football facilities. That is actually a great deal of balance considering that football generates a net profit of $38 million a year while UGA basketball has only generated a profit greater than $1 million 2-3 times in its 100 year history. Prior to 1995, UGA's last basketball facility related investment of any note was in the 1960s when we tricked the state legislature into building a rodeo facility that could double as a gym. Dooley flat out did nothing to support basketball other than hiring a high profile coach coming off a Final Four appearance in Hugh Durham and stumbling into Tubby Smith virtually by accident. We were so far behind in the hoops arms race that our recent investments didn't look as significant as they should. But I digress. My point: It appears to me based on my understanding of the facts that Damon isn't hiding our money under the mattress. He could do a better job of explaining where the "unallocated funds are going" in the areas of new facilities. 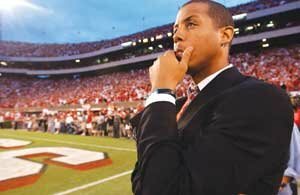 But he's doing a better job of scheduling and investing in hoops than we've seen in Athens since before Dooley arrived. And if you haven't seen the video for the Practice Facility, check it out here. Well put. My response is available at Dawg Sports. We should be the most profitable athletic program in the country. Also, I think we SHOULD be one of the top 5 revenue producing schools in the country. Let's face it, UGA sports, especially football, is the most consistently valuable and marketable sports property in the Atlanta market. If you take a look at the top 10 Nielsen DMA's, Atlanta is the only one that you could consider to be college sports dominant. Add in the fact that there are only two high profile D-1 programs in that market and we should be rolling in the dough.